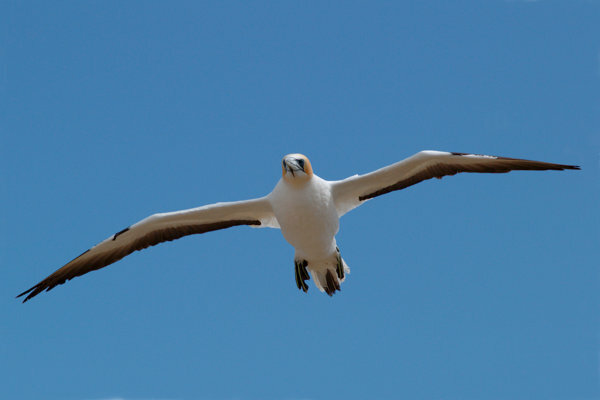 The Australasian gannet (Morus serrator), known as takapu in Maori, is one of three species of gannet which belong to the booby family. 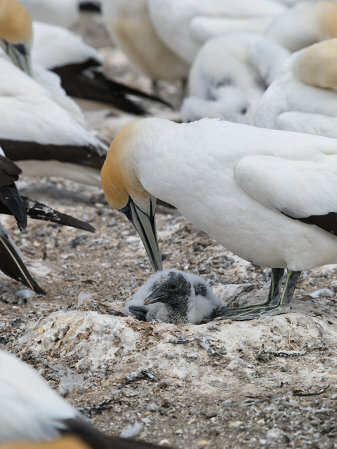 They are usually found in large colonies on offshore islands around New Zealand and southern Australia and have been nesting at Cape Kidnappers since the 1870s. 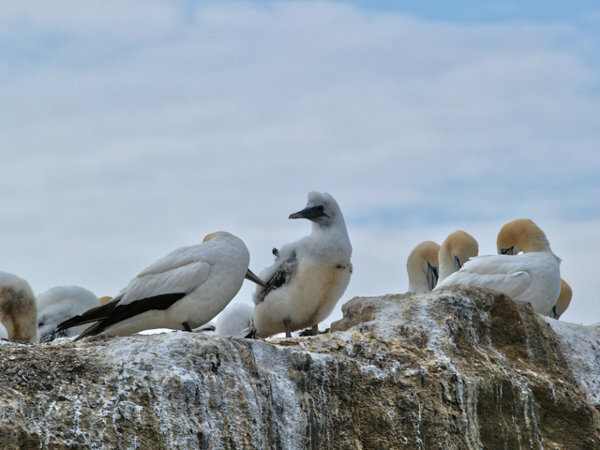 The gannets' average lifespan of 25 to 40 years has a remarkable start. The 16-week-old chicks, which have never been airborne before, take on a 2,800 km Tasman Sea crossing. Two to three years later, the young birds return from Australia to undertake tentative mating. 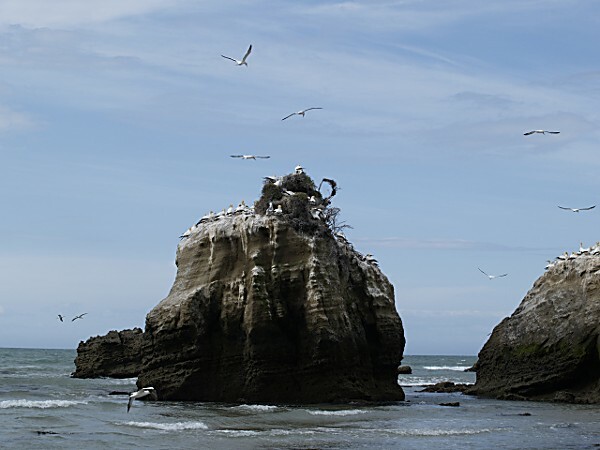 However, it is not until they are five years old that they nest in ernest, after which most spend their lives around the coastal New Zealand seas. 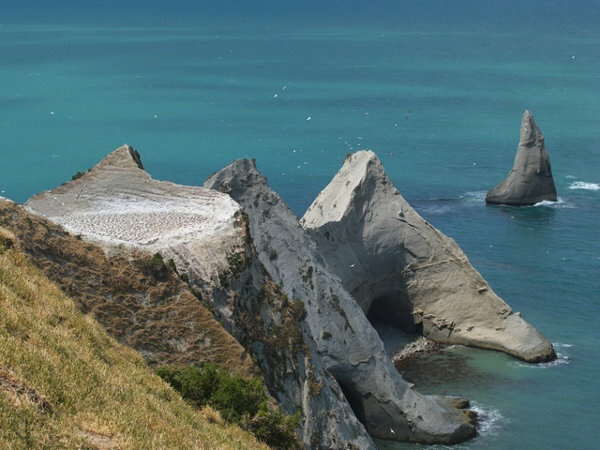 The Cape Kidnappers Gannet Reserve is managed by the Department of Conservation for the purpose of protecting the gannet nesting sites. 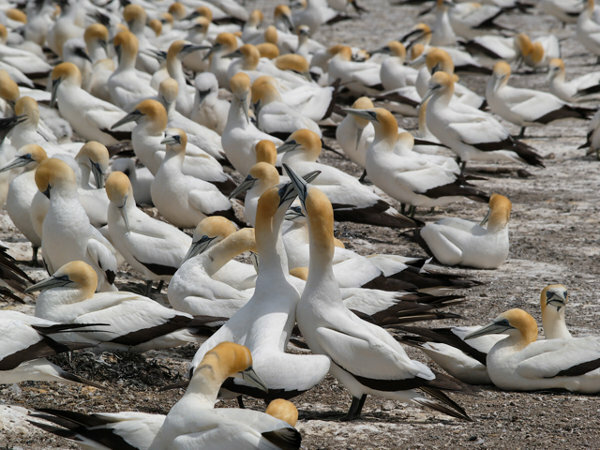 The 13 hectare reserve includes the Saddle and Black Reef gannnet colonies. Both are closed to public access, but the black Reef colony can be viewed from the beach. 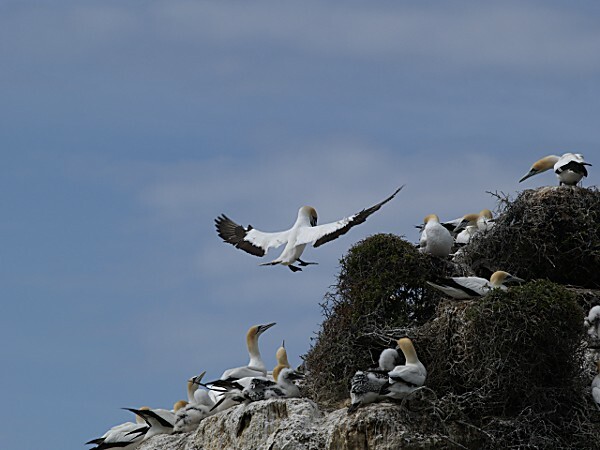 The Plateau colony is the main place for viewing the nesting gannets and there are also good panoramic views from this elevated headland. This colony is located on private land. Visitors are asked to cooperate with the landowners by keeping to the defined track and not disturbing stock. Looking out to the Cape itself, with the Saddle colony in the foreground. Bringing seaweed. 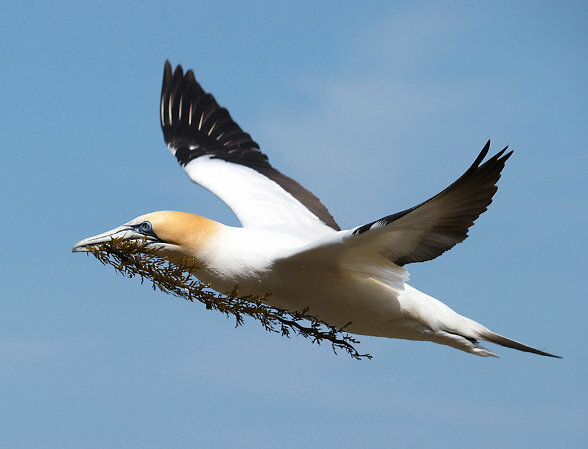 Nests are very simple affairs, consisting of a shallow scraping, and lined with small amounts of seaweed. 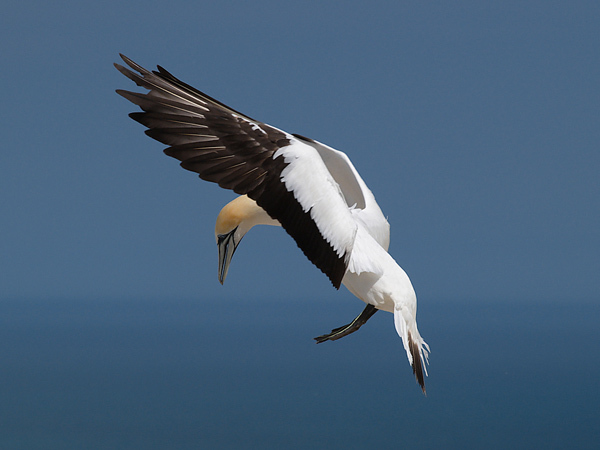 Gannets are able to soar effortlessly on the updrafts as they approach the colony. 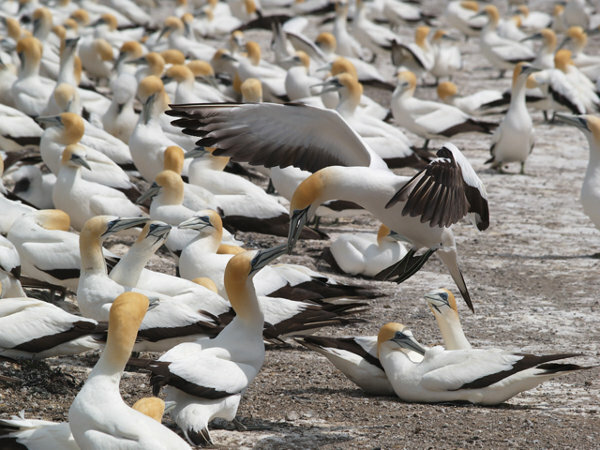 Gannet pairs go through elaborate welcoming ceremonies when one of the gannets returns from the sea. This chick is almost as large as its parent.